509 Beacon is located on the south side of Beacon, between Massachusetts Avenue and Charlesgate East, with 507 Beacon to the east and 511 Beacon to the west. 509 Beacon was designed by Carl Fehmer, architect, and built in 1887 by James Smith, mason, one of a symmetrical pair (507-509 Beacon). 509 Beacon was built for marine and fire insurance broker Samuel Seabury Allen and his wife, Hannah Doane (Wells) Allen. He is shown as the owner on the original building permit application, dated March 21, 1887. In 1888, Carl Fehmer designed a house in a similar design at 505 Beacon. Samuel Allen acquired the land for 509 Beacon in two transactions: he purchased a five foot wide lot to the west on January 15, 1887, from a real estate investment trust formed by Francis A. Palfrey, Francis A. Osborn, and Grenville T. W. Braman, and he purchased a fifteen foot wide lot to the east on February 16, 1887, from Louis Curtis. The fifteen foot wide lot was part of a 70 foot wide lot Louis Curtis had acquired on November 24, 1885, from Lewis A. Dabney, who had purchased it on October 31, 1885, from Henry M. Whitney. All of the land was part of a parcel originally purchased from the Boston Water Power Company on June 1, 1880, by Francis A. Palfrey and his partners. 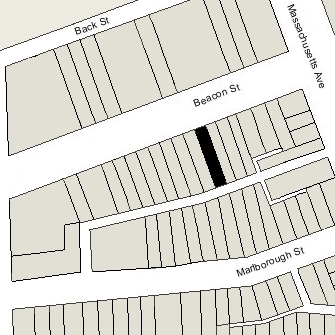 Click here for an index to the deeds for 509 Beacon, and click here for further information on the land west of Massachusetts Avenue between the south side of Beacon and the north side of Commonwealth. By the 1887-1888 winter season, Samuel and Hannah (Wells) Allen had made 509 Beacon their home. They previously had lived at 76 Mt. Vernon. They also maintained a home in York Harbor, Maine. Samuel Allen died in June of 1892. In his will, he left 509 Beacon in trust for the benefit of his wife and, upon her death, their four children: Edith Seabury Allen, Seabury Wells Allen, Marjorie Binney Allen, and Dorothy Doane Allen. Marjorie and Dorothy Allen were twins. Hannah Allen continued to live at 509 Beacon with their children. Edith Allen married in June of 1895 to John Prentiss, a lawyer, and they moved to The Ludlow (southwest corner of Clarendon and St. James). He died in March of 1897 and Edith (Allen) Prentiss resumed living at 509 Beacon with her mother and siblings. During the 1897-1898 winter season, the Allen family was living elsewhere and 509 Beacon was the home of James Hewitt Morgan and his wife, Martha (Leavitt) Morgan. They had lived at 314 Dartmouth during the previous season. They moved from 509 Beacon by the 1898-1899 season, probably to their home on Grindstone Island in New York, and the Allens were once again living at 509 Beacon. Edith (Allen) Prentiss married again in August of 1901 to Humphrey Turner Nichols, a writer; after their marriage, they lived in Europe and York Harbor. Marjorie Allen married in August of 1905 to Morland Carter and they moved elsewhere. Hannah Allen continued to live at 309 Beacon with her unmarried children, Seabury and Dorothy Allen. Seabury Allen was a physician and maintained his office at 509 Beacon. Seabury Allen married in June of 1912 to Elizabeth Upton. After their marriage, they moved to 6 Acorn and then to 20 Charles River Square. 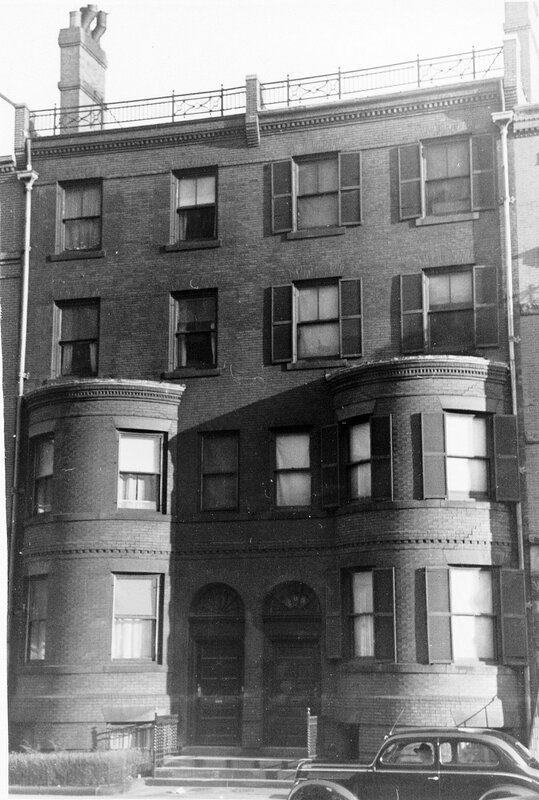 He continued to maintain his medical office at 509 Beacon in 1917, but had moved it to 20 Charles River Square by 1920. By the 1920-1921 winter season, Hannah and Dorothy Allen had been re-joined at 509 Beacon by Marjorie (Allen) Carter, who had divorced from her husband. Hannah Allen died in March of 1934. Marjorie Carter and Dorothy Allen continued to live at 509 Beacon until about 1940. 509 Beacon was shown as vacant in the 1941-1944 City Directories. In April of 1944, real estate dealer Howard S. Cosgrove acquired 509 Beacon from Samuel and Hannah Allen’s children and heirs, and the trustees under his estate. On April 28, 1944, the property was acquired from Howard Cosgrove by real estate dealer Benjamin Lipsky. In May of 1944, he applied for (and subsequently received) permission to remodel the house, and in April pf 1945, he filed for (and subsequently received) permission to do further remodeling and convert the property into a lodging house. By 1945, 509 Beacon was the home of Mrs. Janetta W. (Stratton) Huntington, the former wife of Clarence Morgan Huntington, who operated it as a lodging house. She previously had lived at 80 Brighton in Allston. 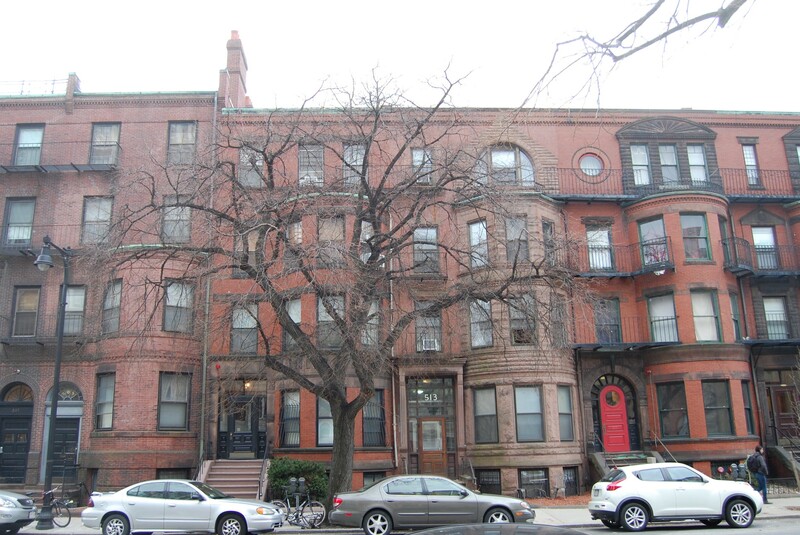 By 1946, she had moved to 4 Reedsdale in Allston. On May 1, 1945, Benjamin Lipsky transferred 509 Beacon back to Howard Cosgrove, and on the same day it was acquired from him by Miss Jean (Jennie) D’Amore. On July 23, 1945, Jean D’Amore transferred the property to her mother, Josephine (Cuoco) D’Amore, the former wife of Santo D’Amore. By 1948, 509 Beacon had become the home of Josephine D’Amore and her unmarried daughters, Mary and Jean D’Amore, who operated it as a lodging house. They previously had lived at 74 Salem and Mary D’Amore had operated the Taormina Restaurant at 76 Salem. In 1949, Mary D’Amore married Sidney Paul Dobrov, a grocer. After their marriage they moved to 304 Commonwealth. In April of 1951, Josephine D’Amore purchased 304 Commonwealth and the Dobrov’s operated it as a lodging house. Josephine and Jean D’Amore continued to live at 509 Beacon, joined in the mid-1950s by Josephine D’Amore’s daughter, Nina, the former wife of Anthony T. Nogueira, who had resumed her maiden name, Nina D’Amore. 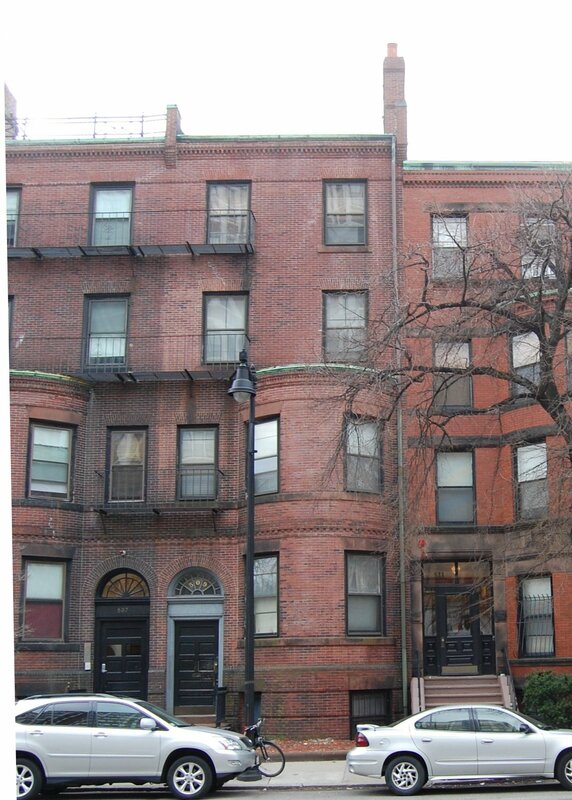 By 1962, Josephine D’Amore had acquired 250 Newbury, where she moved temporarily and operated a lodging house. In March of 1962, she acquired 291 Commonwealth, an apartment house. At about the same time, Jean D’Amore moved to 304 Commonwealth, where her brother-in-law and sister, Sidney and Mary Dobrov, continued to manage the lodging house. Mary Dobrov and Jean D’Amore operated the Mar-Jean Sportswear company together. Nina D’Amore continued to live at 509 Beacon and operate it as a lodging house. She subsequently married to Robert Millen, after which they lived in Canton. 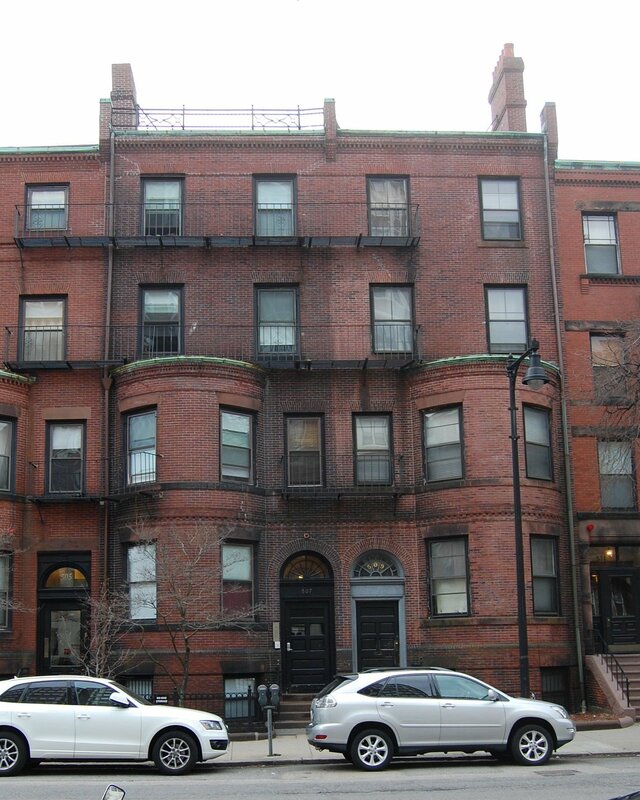 By 1963, Josephine D’Amore had moved back to 509 Beacon, but continued to own the lodging houses at 250 Newbury and 304 Commonwealth. She continued to live at 509 Beacon in 1964, but by 1966 had moved to an apartment at 291 Commonwealth. On March 7, 1966, 509 Beacon was purchased from Josephine D’Amore by real estate dealer Joseph E. Coppola and his wife, Susan Frances (Birmingham) Coppola. On March 15, 1966, they transferred the property to themselves as trustees of the J. E. Coppola Realty Trust. On November 15, 1966, 509 Beacon was acquired from the Coppolas by Phillip Lemelman, trustee of the Bethan Realty Trust. It continued to be a lodging house. On January 10, 1975, 509 Beacon was acquired from Phillp Lemelman by Rose Bornstein, trustee of the Rochelle Realty Trust. Rose Rochelle (Goldberg) Levin Glazer Bornstein was the former wife of Reuben Levin and Max L. Glazer. She was a retired pianist and entertainer who performed as (and legally changed her name to) Rose Rochelle. She had married in the early 1960s to Morris Bornstein, after which she was known as Rose Bornstein. He died or they separated by 1965. She lived at 19 East Concord. On April 28, 1975, 509 Beacon was purchased from Rose Bornstein by William Paul Feldkamp. On October 25, 1977, 509 Beacon was acquired from William Paul Feldkamp by Marilyn Kapetanakis of Medford. On March 12, 2002, she transferred the property to herself as trustee of the 509 Beacon Street Realty Trust. 509 Beacon continued to be a lodging house in 2018.